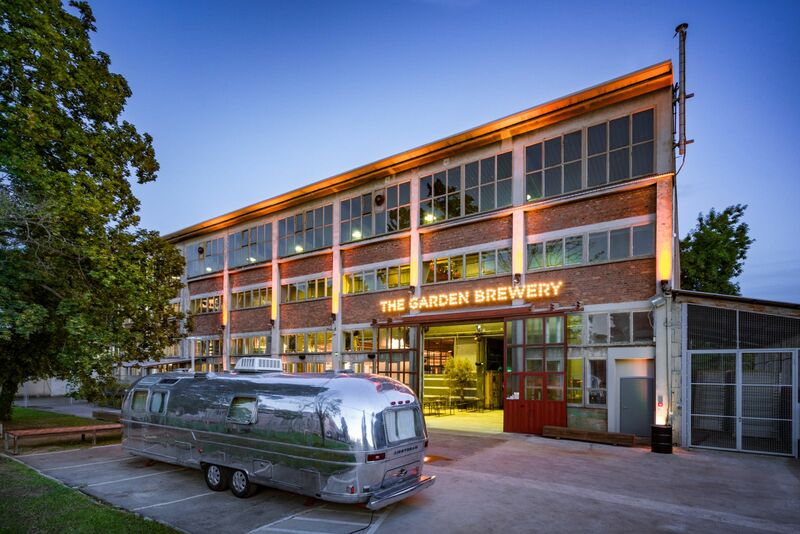 While scout watching for a venue for our Conventa Trend Bar 2017 event, we came across The Garden Brewery, a venue that immediately astounded us. It took a millisecond for us to fall in love with it and to know that it is a perfect venue that perfectly reflects our approach to meetings. The venue is located a bit out of the city centre, in an industrial area where a magnificent but abandoned industrial factory has been turned into a brewery. Industrial set-up with a warm and homely feeling – a perfectly revitalized venue! The team behind The Garden Brewery is the same one that led that cult Garden Festival and later decided to go for the new adventure of opening the brewery. And the rest is history. With events open to the public as well as to corporate events, the brewery shows its full potential with its excellent sound and lighting space and is also featured as the only brewery in the world that has a disco ball. The Garden team clearly embarked on another glorious adventure and the significant investment in it aims to boost the craft revolution, provide new jobs and strive to be active throughout the year with production, sales and the export of craft beer. As they say in The Garden Brewery – they care about beer. A lot. Using only very best natural ingredients and without filter or pasteurizing, as it is unnecessary and removes the great flavors and aromas. Drinking beer straight from the source is a dream of each and every beer lover, isn’t it? You can taste 11 different kinds of beer, from India Pale Ale, Traditional (German) Pilsner, American Pale Ale, Berliner Weiss, Porter, Breakfast Stout, Session IPA, Fresh hop IPA, as well as some other refreshing and surprising new combinations. Have you ever tried a Stout, dark and smooth with notes of coffee, and chocolate? What about Vanilla & Chocolate Porter aged in French oak? Put briefly, they have it all, and for each and every taste and desire. Moreover, they also offer guided brewery tours, where you can learn more about the beer making process and why they use certain hops, as well as what difference the choice of grains make and how the packaging is all integral to the finished product. You will see parts of the brewery that the general public normally doesn’t have access to. There is no better place to enjoy The Garden beers than straight from the source, from the place where it was created. And guess what? It is also a great incentive idea – beer lovers will be highly impressed! When talking about beer, of course, we can’t overlook food, and what is the perfect combo when it comes to craft beer? Burger, of course! They make a great couple, and The Garden Brewery had that in mind when their friends from the Submarine BBQ joined them at the venue. The burgers on offer here are not just any kind of burgers, however – they offer a wide variety of natural burgers, fries, and organic ice cream, using only natural, local ingredients, such as 100% pure beef from a Croatian farm, burger buns from a Zagreb bakery, cheese from Zagorje, bacon from Dalmatia, lettuce and tomatoes from Slavonia, truffles from Istria… Wow! A burger & beer – it will seriously make your day, we promise! Who wouldn’t want to host an event at this extraordinary venue? The venue, tap room and garden are really top choices for various events – they’ve already hosted everything, from weddings and photo shoots to private and corporate parties… As they handle each request individually, they will make sure everything you need will be steady and ready for your arrival. From what we experienced, it’s clear that every special wish can be taken care of. The dramatic industrial venue with a visible section of the manufacture of premium craft beers, a musical background, an indoor bar of 280m2, a large outside yard with tables and benches, professional sound and light equipment and free car parking are all ready and waiting for you! When in Zagreb, the KONGRES magazine team is at the Garden Brewery. We can’t help ourselves gravitating there and, to be honest, we don’t care – we love it too much!